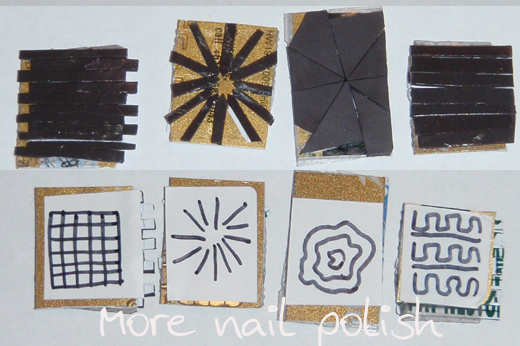 Last week I posted about how to create your own nail art magnets at home using those thin large flat fridge magnets cut into various designs. Here are the four designs I made. Here are the cut up magnets, stuck to an old cut up credit card. For exact details on how this works and what I have done below, check out my previous post. First is the square grid pattern. 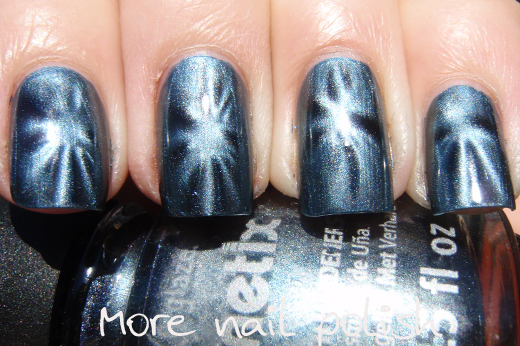 I have to say that this polish from the China Glaze Magnetix collection doesn't actually have very strong magnetism. Other polishes from that collection showed this magnet off much better, but I wanted to try and post different coloured swatches (especially as I had not yet worn this particular shade yet). 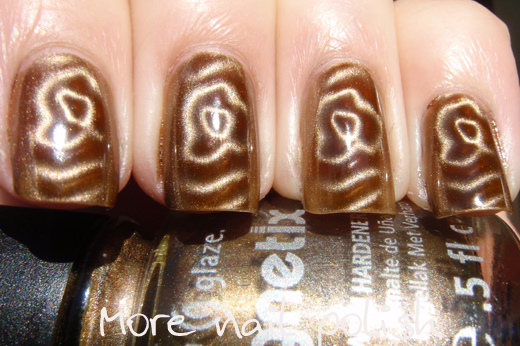 I believe this grid will be a similar look to one that is on the new China Glaze magnet. It has this grid design, some concentric circles, and some vertical lines. 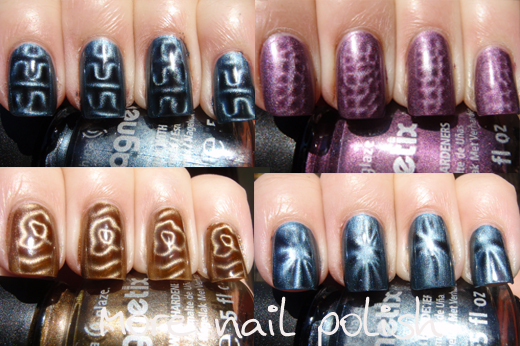 The main difference is that my grid is much smaller with about a 10x10 grid and the China Glaze one looks to be 3x3. Creating this grid magnet design is really simple, just cut strips of your magnet across the grain of the polarization and then offset each second strip by about the distance of the stripes on your magnet. My magnet had really close together stripes, so I only had to offset mine by about 1mm, but if your magnet has lines that are further apart, then you will need to offset more. 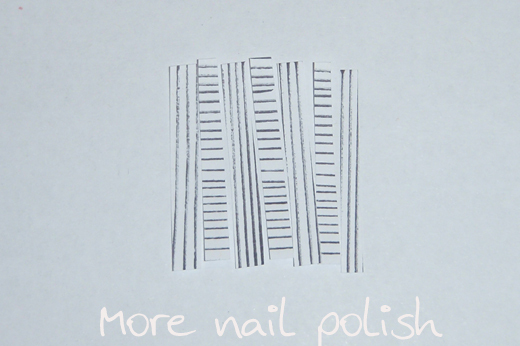 You will also end up with larger squares (probably more like the China Glaze one). Next I tried to create a star magnet, I already have two different star magnets, and this one turned out ok, but it still needs some work I think, or perhaps it was just my rather average application of this one. 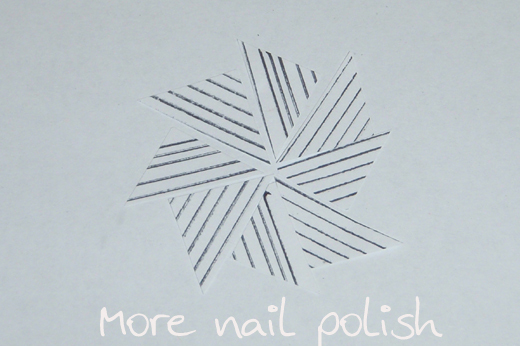 To make a star design, cut your magnet in thin strips along the grain of the polarization, then position the different strips into a star design. Next up is something a little crazy. The truth is, I wasn't sure what it would create, I was just cutting up the magnet trying to work out another way to put them together. Its sort of a crazy circular design, slightly flower like. In fact, I think I will call it the flower magnet. This is how I cut up the magnet to create this design. I never expected the result to be squiggly circles. Finally, my favourite new design, which I'm calling an Aztec design. It has squiggly lines, separated by a straight line. This was actually really simply to create. I cut up some strips of the magnet going with the polarization grain and some strips against the polarization grain, then I just alternated them when I stuck them down. 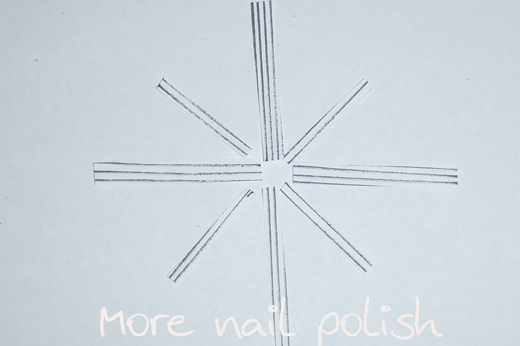 Has anyone tried making some magnets at home yet, or are you all sick of magnetic polishes already. Me, I'll never be over magnetic polishes. 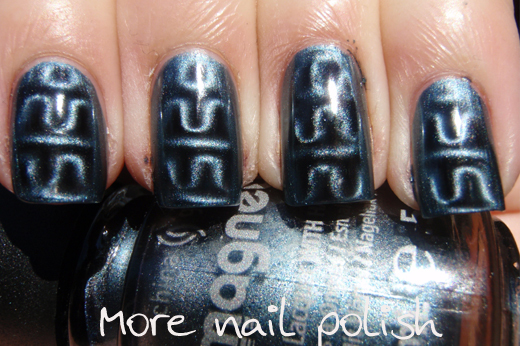 I think the idea of them is so freaking cool, and it totally blows muggles minds when I explain about these sorts of polishes! OMG you are so blooming clever, love it!! 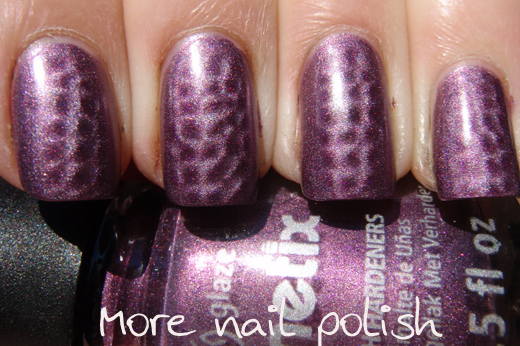 I particularly love the grid, can you try and suss out the fishnet which Nails Inc do? I'm deffo going to give this a try, where's the fridge magnet!! Love you! I'm not quite sure of which magnets it is that you're cutting into pieces, but I love the result. It's cool! Just regular flat magnets that you get with advertising on them, like from trades people. We have about 10 on our fridge. 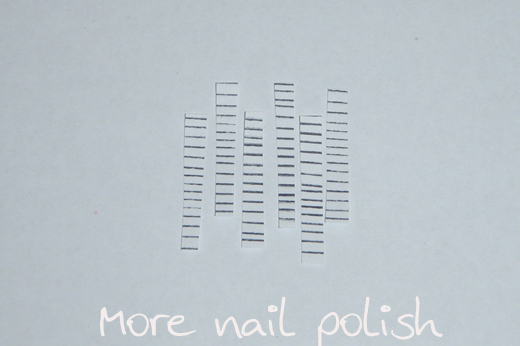 They make excellent lines in magnetic nail polish. wow, I can't believe how the last 2 have curves in them, when your pattern doesn't -you must have been delighted! This is GENIUS. Thank you for posting this idea. I love the aztec design! How awesome..let me go looking for magnets..
its ridiculous how smart you are! i wish i could wrap my head around this, but im still in awe of it. You are amazing!! I still can't figure out how you did this! These are so cool. I need to find some magnets I can cut up and try to get a good strong star with. Omg amazing! I would try these out but I don't own any magnets...nor do I know where to buy those flat kinds you can cut up. 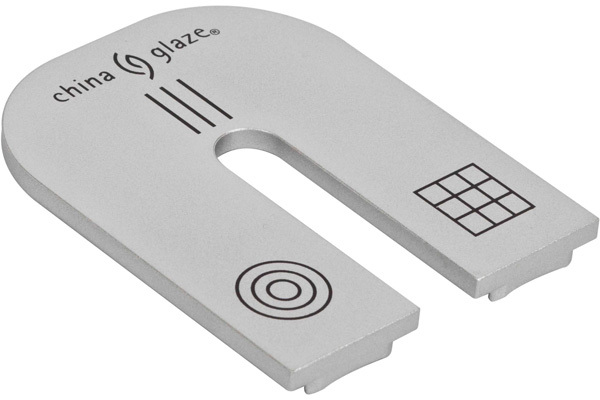 I didn't realize there was another China Glaze magnet out there! Thanks for sharing your designs and how to make your own magnets! The starburst one is still my fave! Wow that is SUPER clever!! I think I may have to try this! That is a really great idea, I love the flower-like one. I can't even imagine the time that went into this--so creative, and I love the results! genius designs!!! I hope I could try this at home. but I haven't yet have any magnetic polishes.. I made some at home, but for reasons unknown, I can't get the patterns to show up on my nails even though they show up on the bottle. :( Well, it did show up on one nail, but after that, I've had no luck. It must be the way I'm applying it. I have to figure it out! This is EPIC! Thank you so much for sharing! Such a great idea!!!!! The flower magnet is my favorite! The squiggly one is my favorite. I love it! You're so darn creative. Wow, how did you create all these unique designs! Can you create a video doing it? Just wondered if you'd sussed out how to do the circle magnet?? Ha, nope - that one still eludes me! Jane - have a read of this post, I go into a bit more detail about finding the polarization grain on the magnet.